We deliver a number of international, regional and local training programs, tailored to meet the public health priorities of different regions. In addition to the direct advantages that come with developing skills, our training initiatives promote discussion, mutual support, and the creation of networks of experts that stand the test of time. This interconnection is a key factor that we emphasize whatever the content and duration of the course. Intensive courses on key issues in vaccinology (ADVAC) and diagnostics (ACDx), are running every year for one or two weeks at the Les Pensières. 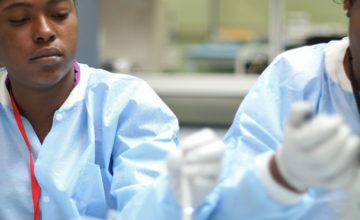 Degree courses, such as the three trimester BAMS (Bachelor in Applied Medical Sciences) course in Mali and Haiti, are aimed at lab technicians. The BAMS program strengthens technicians’ theoretical knowledge and practical skills, with a focus on best practices and logistics. The course is given in partnership with the School of Biology, Biochemistry and Biotechnology (ESTBB) of the Catholic University of Lyon. BAMS’ local partners are the National Public Health Laboratory (LNSP) in Haiti and the Charles Mérieux Center for Infectious Disease in Mali. “Vaccinology in Africa”: running since 2013, this initiative is coordinated by Jenner Institute and supported by the Mérieux Foundation and its industry partners. It is designed to improve medical practice for preventing infectious diseases through vaccination. WASH (water/hygiene/nutrition) integrated training program: organized by the Bioforce Institute at the Charles Mérieux Center for Infectious Disease in Mali. Jointly funded by UNICEF and the Mérieux Foundation, under a partnership with Action Against Hunger these courses are aimed at health and sanitation professionals, with a view to promoting sustainable access to quality services. Health education programs: running in Madagascar, Haiti and Mali. Training for trainers, to support the coordination of projects that cater to local needs: in several West African countries (Côte d’Ivoire, Burkina Faso, Cape Verde, Guinea, Niger, Togo and Mali) and in Laos. The Mérieux Foundation launched the GLOBE (Global Link for Online Biomedical Expertise) portal in 2009. GLOBE’s content is available in French and English, and focuses on three main issues: science and activities in biology labs, epidemiology and monitoring diseases, prevention and vaccines. GLOBE is for healthcare professionals in developing countries, and boasts more than 1600 active members in its 12 participating networks (such as RESAOLAB, GABRIEL, ACDx, ADVAC, and BAMS), stemming from the work carried out by the Foundation and its partners. 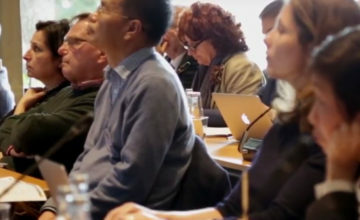 GLOBE offers a range of online courses and enables experience and best practices to be shared in real time, in particular during health crises. Over 30,000 visitors every year, logging on from almost 200 countries worldwide.